Observers in the British Isles blessed with clear skies at dusk can see the 10-day-old waxing gibbous Moon pass in front of a naked-eye star known as kappa Virginis soon after 11pm BST tonight. Since the star disappears at the Moon’s darkened limb, it will be an easy target in most binoculars. AN graphic by Ade Ashford. 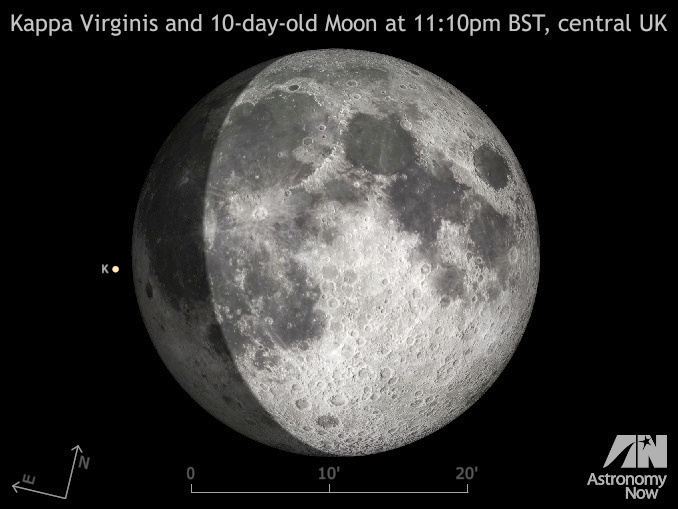 If your UK sky is clear at dusk tonight, I invite you to look at the 10-day-old Moon set against the stars of Virgo. 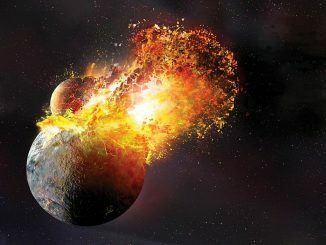 If you think that the waxing gibbous lunar orb seems somewhat smaller than usual then you’d be right, for at lunchtime today the Moon reached apogee — the point in its monthly orbit when it is furthest from the Earth. 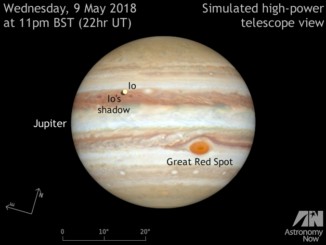 However, if you look closely at the vicinity of the Moon with a binocular or small telescope at 11pm BST on 15 June you will notice something else: a magnitude +4.2 star tantalisingly close to the advancing, darkened lunar hemisphere. This star is known as kappa (κ) Virginis and keep watching, for it is about to be occulted (hidden) by the Moon. The actual time at which the Moon passes in front of κ Virginis depends on where you live. For London, the star’s disappearance occurs close to 11:19pm, while in Edinburgh, it happens somewhat earlier at 11:10pm. If you live close to the heart of the British Isles, then you can see κ Virginis wink out around 11:13pm (all times given in BST). As with all occultation observations, it pays to be prepared and setup a few minutes before the appointed time so that you can savour the approach of the Moon to the star. Reflect, too, on the fact that Kappa Virginis (α=14h 12.9m, δ=-10°16′ J2000.0) is an orange K-type giant 23 times the diameter of our Sun, approximately 250 light-years from Earth. Find out all you need to know about what is currently happening in the night sky and how to observe it in the June 2016 edition of Astronomy Now. The orbits of Jupiter’s large Galilean moons Io, Europa, Ganymede and Callisto are presently almost edge-on to our line of sight, causing the moons to regularly eclipse and occult each other. Multiple shadow transits are also on view!